Keynote speaker: Rev. Jim Antal, denominational leader, climate activist, and author of Climate Church, Climate World: How People of Faith Must Work for Change. Sponsored by the Plymouth Creation Care and Justice Coalition, Iowa Interfaith Power and Light, Interfaith Green Coalition, and the Indianola Green Team. Rev. 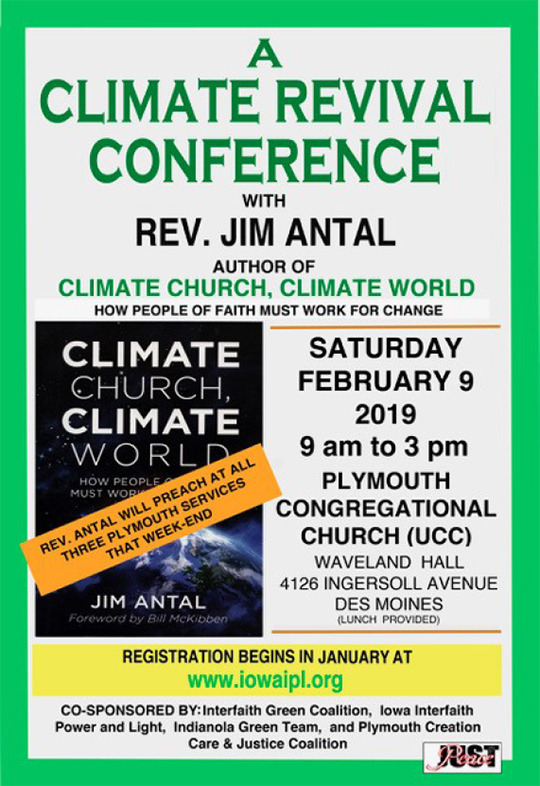 Antal will speak Saturday morning, followed by a panel of Des Moines area and Iowa climate experts discussing faith-based and secular solutions to the climate crisis. Lunch provided at no cost (good will offerings accepted). AGENDA Panelists include religious, climatology, legal, advocacy, science, and civic leaders. There is no cost to attend the conference but registration allows us to determine attendance numbers. A free will offering will be collected at lunch. In addition to the conference, Rev. Antal will lead worship at Plymouth Church Saturday at 5:30 pm and Sunday at 9 am and 11 am. Rev. Antal’s visit and the conference are supported by the Plymouth UCC Foundation and the Central Association Iowa Conference UCC.